Description: A full sheet of copper 1,2,3 or 5 ounces per square foot, permanently bonded on both sides by asphalt to heavy, waterproofed, creped kraft paper.The 3 and 5 ounce weights are reinforced with glass fibers to meet FHA, GSA and Corps. Of Engineers standards. The combination of surface texture for full bonding with mortar, thin section for ease of installation and low cost have made section for ease of installation and low cost have made Cop-R-Tex Duplex a very popular selection. Rolls 60’ long, 36” wide. Can be slit to multiple widths. Cop-R-Tite Mastic is the approved mastic to be used to splice all of York’s copper laminated flashings. Rolls 200’ long, 36” wide. Can be slit to multiple widths. A full sheet of 3 0z. 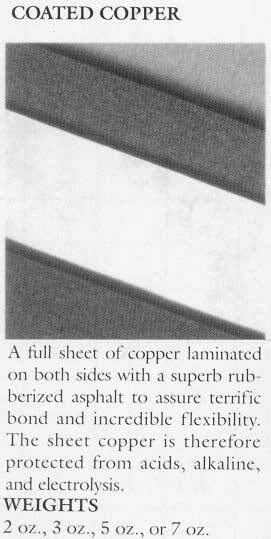 copper laminated on both sides with a dense polyethylene. Installation: Cop-R-Tile Mastic is the approved mastic to be used to splice all of York’s copper laminated flashings. Description: For over 60 years the Copper Fabric Flashing brand name has stood for the highest quality laminated copper flashing in the industry. There is no better way to protect masonry walls from moisture damage than to install the largest selling name in permanent protection. 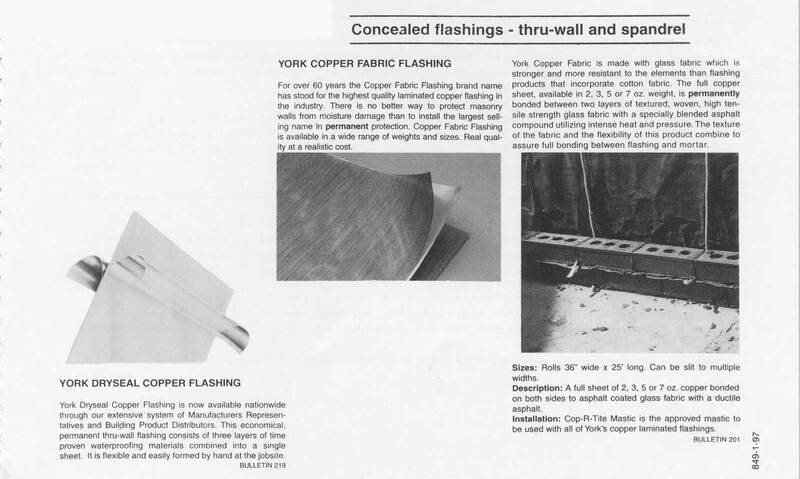 Copper Fabric Flashing is available in a wide range of weights and sizes, Real quality at a realistic cost. York Copper Fabric is made with glass fabric which is stronger and more resistant to the elements than flashing products that incorporate cotton fabric. The full copper sheet, available in 2, 3, 5 or 7 oz. weight, is permanently bonded between two layers of textured, woven, high tensile strength glass fabric with a specially blended asphalt compound utilizing intense heat and pressure. The texture of the fabric and the flexibility of this product combine to assure full bonding between flashing and mortar. Rolls 36” wide x 25’ long. Can be slit to multiple widths. Description: A full sheet of 2,3, 5 or 7 oz. copper bonded on both sides to asphalt coated glass fabric with a ductile asphalt. Cop-R-Tite Mastic is the approved mastic to be used with all of York’s copper laminated flashings. Description: An economical duplex, reinforced, metal flashing. Copper and Lead are combined; the total weight of metals is 2, 3, 5 or 7 ounces per square foot. The bonded metal sheet is then covered on both sides with asphalt and two heavy duplexed sheets of creped kraft paper which are reinforced with strands of fiberglass. The creped surfaces bond well with mortar. Rolls 36” wide, 2 and 3 ozs., 60’ long, 5 oz. and 7 oz., 40’ long. Can be slit to multiple widths. Copper and Lead combined, total weight of the two metals equaling 2,3,5 or 7 ounces per sq. ft., laminated with asphalt and bonded on both sides with creped duplex covering and reinforced with interspersing fiberglass strands. Description: An economical duplex, reinforced, metal flashing. Copper and Lead are combined; the total weight of metals is 2, 3,5 or 7 ounces per square foot. The bonded metal sheet is then covered on both sides with asphalt and two heavy duplexed sheets of creped kraft paper which are reinforced with strands of fiberglass. The creped surfaces bond well with morar. Cop-R-Tite mastic is the approved mastic to be used with all of Yorl’s copper laminated flashings. 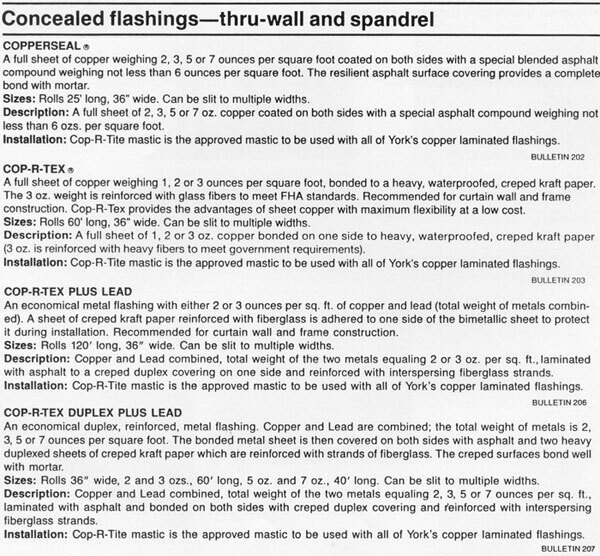 Description: An economical metal flashing with either 2 or 3 ounces per sq. ft. of copper and lead (total weight of metals combined). A sheet of creped kraft paper reinforced with fiberglass is adhered to one side of the bimetallic sheet to protect it during installation. Recommended for curtain wall and frame construction. Rolls 120’ long, 36” wide. Can be slit to multiple widths. Copper and Lead combined, total weight of the two metals equaling 2 or 3 oz. per sq. ft. laminated with asphalt to a creped duplex covering on one side and reinforced with interspersing fiberglass strands. Cop-R-Tite mastic is the approved mastic to be used with all of York’s copper laminated flashing. Description: A full sheet of copper weighing 1,2, or 3 ounces per square foot, bonded to a heavy, waterproofed, creped kraft paper. The 3 oz. weight is reinforced with glass fibers to meet FHA standards. Recommended for curtain wall and frame construction. Cop-R-Tex provides the advantages of sheet copper with maximum flexibility at a low cost. A full sheet of 1,2 or 3oz. copper bonded on one side to heavy, waterproofed, creped kraft paper (3 oz. is reinforced with heavy fibers to meet government requirements. Cop-R-Tile mastic is the approved mastic to be used with all of York’s copper laminated flashings. Description: A full sheet of copper weighing 2,3,5 or 7 ounces per square foot coated on both sides with a special blended asphalt compound weighing not less than 6 ounces per square foot The resilient asphalt surface covering provides a complete bond with mortar. Rolls 25’ long, 36” wide. Can be slit to multiple widths. A full sheet of 2,3,5 or 7 oz. copper coated on both sides with a special asphalt compound weighing not less than 6 ozs. per square foot. Manufacturer: Sandell Mfg. Co. Inc. Description: A full sheet of copper laminated on both sides with a superb rubberized asphalt to assure terrific bond and incredible flexibility. The sheet copper is therefore protected from acids, alkaline, and electrolysis. 2 oz., 3 oz., 5 oz., or 7 oz. Description: A superior waterproofing material that has been of the highest quality for over 50 years. Sandell Copper Fabric is made up of a full sheet of copper foil laminated on both sides with a treated glass fabric bounded under pressure with a specially blended asphalt to create terrific flexibility and guarantee a full bond between flashing and mortar to ensure superb moisture protection. 2 ozs., 3 oz., 5 oz., or 7 oz. Description: The flexibility and the toughness of copper are combined under pressure on both sides with a layer of reinforced kraft paper saturated in waterproofing asphalt. The heavy concentration of pressure and a special blend of elastic asphalt is done to assure complete bond, and guarantee excellent moisture protection. 2 oz., 3 oz., or 5 oz. Description: Low in cost and easy to handle a full sheet of copper laminated on one side with a reinforced kraft paper, bonded together under high pressure with a special blended waterproofing elastomeric asphalt recommended for curtain wall and frame construction. 2 pz, or 3 oz. Description: A cut back asphalt, containing long fibered material, manufactured in proper consistency for easy application. The mastic is used in conjunction with setting and sealing of joints in flashing. It is also used above and below grade for damp proofing purposes. Furnished in 5 gallon pails. approximately 25 sq. ft. per gallon with 1/16” thickness, 12-1/2 sq. ft. per gallon with 1/8” thickness. Description: Formulated to give a perfect bond between Nuflex plastic flashing and all construction surfaces. Applied cold with trowel, it forms a tough, elastic coating which adheres firmly and adjusts itself with Nuflex Plastic Flashing to contraction and expansion caused by temperature cycling and structural movements. approximately 25 sq. ft. per gallon with 116” thickness, 12-1/2 sq. ft. per gallon with 1/8” thickness.